Orfeo: Aaron Sheehan and Carrie Henneman Shaw Photography: André Costantini. 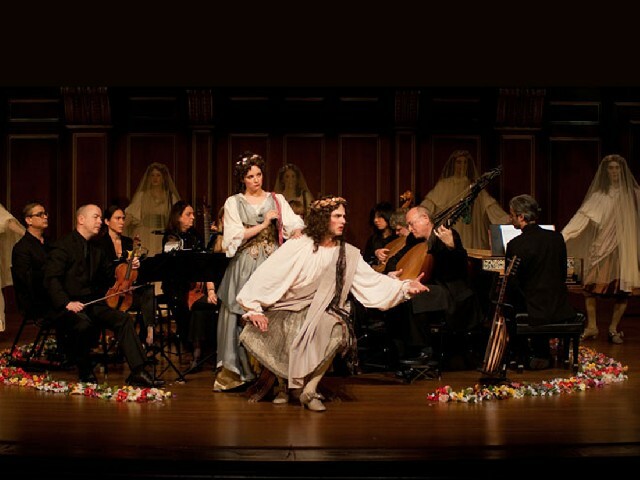 It takes just two measures for Paul O’Dette and Stephen Stubbs, directors of the Boston Early Music Festival – which they founded in 1980 – to capture the incisive brass sounds establishing the mood and tone of this full-length of Orfeo’s musical drama. 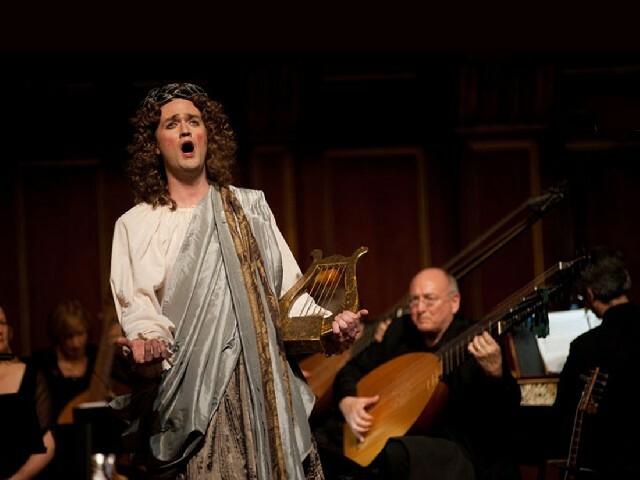 As soon as soprano Mireille Asselin’s passionate, florid voice (heard with Opera Atelier in Dido and Aeneas, and Handel’s Theodora with the Bach Collegium, San Diego) sings the prologue “From my beloved Permessus I come to you,” (Dal mio Permesso amato à voi ne vegno), dancer Carlos Fittante gracefully and sequentially appears as the jester; Hymen, God of Marriage; Pan, God of Sheperds; Thanatos, God of Death; Amor, God of Love and Harpocrates, God of Silence in lavish period costumes and masks imparting rhythmic cadence throughout the opera. Right from the start, an exceptional clarity is apparent in this adaptation of Monteverdi’s stile recitativo, with its subtle and graceful music. This is not a fully staged production but more an early chamber opera, one which includes the surviving music of the published score. An adaptation that returns to the original opera revised version presented in Mantua’s Gonzaga Palazzo Ducale in 1607. 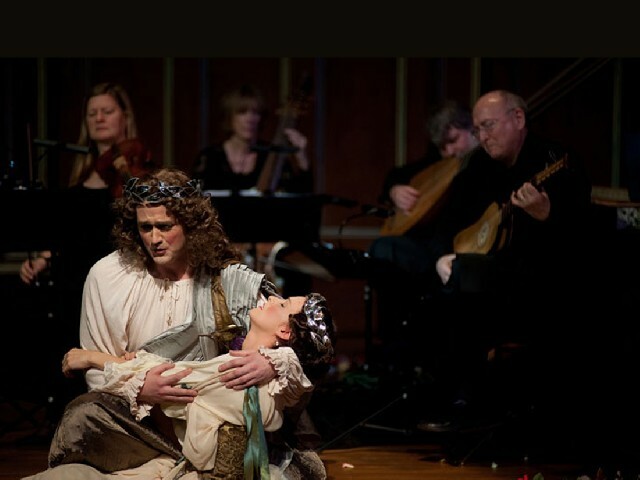 Orfeo’s opera is about the power of singing, the theme around which the entire work is constructed. What does Orfeo want to tell us? For many, it is an illustration of the unlimited power of music. Is it not with his singing that Orfeo makes Charon fall asleep so that he can cross the Styx to bring Euridice – bitten by a snake – back to life? 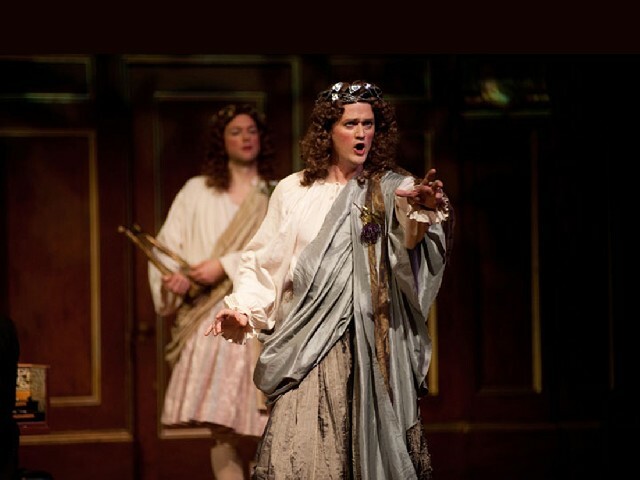 Would Proserpine have interceded with Pluto on his behalf if she was not moved by his lament ¬ embodied here by the fabulous young tenor Aaron Sheehan (who appeared in Charpentier’s Actéon and L’Amour, in Lully’s Psychée, and in Handel’s Acis and Galatea)? Would Apollo have given his son Orfeo the gift of immortality permitting him to contemplate Euridice residing among the stars if he had not been touched by the sound of his lyre? As we know from historical documents, Monteverdi and his librettist Alessandro Striggio were obliged to revise the Act V finale. The scene where Apollo leads Orfeo to immortality replaced the deadly Bacchanal initially written by Striggio. In the original ending, the limits of music are emphasized along with the precarious condition of the artist, who is always and contanstly in danger of committing the sin of hubris.